De Queen’s Will Athey pulls into third base in the Leopards’ game with Bauxite. 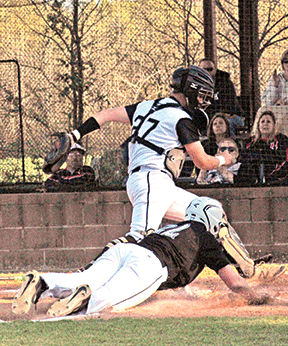 Leopard catcher Brennen Seymour forces out a Bauxite runner at the plate. 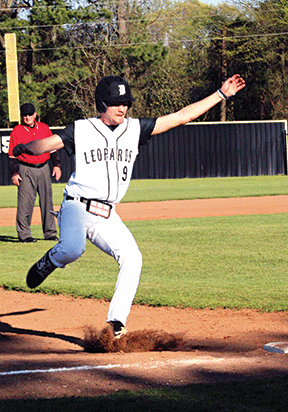 The baseball Leopards suffered multiple self inflicted wounds in an 11-5 loss to visiting Bauxite April 2. Four De Queen errors allowed the Miners four unearned runs. After the Leopards took a 2-0 lead in the first, three Miners crossed the plate in the second. The Leopards scored twice in the bottom of the second, but Bauxite took the lead for good with two runs in the third. They added two more in the fifth and four more in the seventh. De Queen’s final run came in the fifth. De Queen had five hits, all singles. Mack Carver hit two of them. Isaiah Williamson, Will Athey, Brennen Seymour and Benjamin Socash each had one. Quinshaun Bennett-Hale, Seymour, Socash, Williamson and Athey each drove in a run. Three Leopards pitched. Carver got the first four outs, three by strikeout, and gave up four hits and three earned runs. Nathaniel Socash yielded seven hits and three earned runs in five innings. Seymour got the final two outs and gave up one hit and one earned run.